No, this isn’t “Art by an Owl” where they give an actual feathered owl a paintbrush and have it paint a flower like those elephants in Thailand do. This is art by a person named Owl. 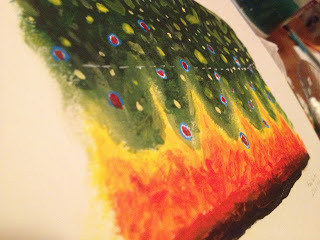 I recently put forth an idea to an up-and-coming young artist that goes by the name of “Owl.” I’m very interested in the different ways people paint fish and trout and Owl has a unique approach that definitely brings a surprisingly unconventional and exciting perspective to these fish. When I asked him if he would be interested in an “art swap,” I wasn’t sure what he would say, because, well, I’m no Owl Jones, but to my surprise he agreed! 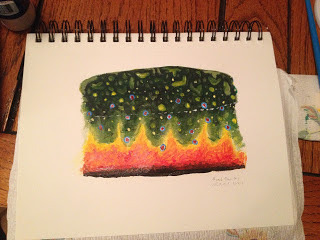 I’ve been slowly working through my project called “Painting Through Prosek.” I’ve been painting my acrylic way through Prosek’s book “Trout: An Illustrated History.” I tried extra hard on the brook trout and thought Owl might like this. All I can say to wrap up this post is to support your local artist, fly shop, retailer, farmer and family member. Great things don’t always come from the big stores with low prices. Rumor Has it there is a New MLW Video: Does It Get Any Better? I know. I know. I can’t wait until YGF and SchnitzerPHOTO release their next installment for The Fly Collective. (The first installment rocked.) Rumor has it… (Thank you Adele for ruining that saying for me… rumor has it.. dah dah dah… rumor has it….) anyway, rumor has it Erin Block will be involved. By the transitive property, since they all are amazing, it will be amazing. But until then, to kill some time (about 3 minutes and 6 seconds to be exact) here is the new My Leaky Waders Video. Does it Get Any Better? 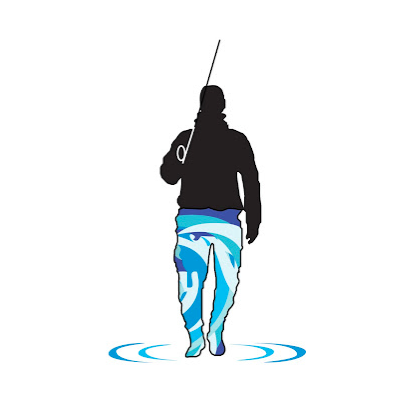 from My Leaky Waders on Vimeo. My last minute trip to the Blue Ridge Mountains turned into a phenomenally successful outing. The weather was wonderful, and the fish were rising. If “Dry or Die” was my mantra, I’ve never lived more fully. Please enjoy the bounty of Blue Ridge Brookies taken on Tenkara. There you go. By the way, rumor has it Adele is taking up fly fishing. Photo of Adele was graciously provided by a google image search. The rumor that Adele is taking up fly fishing was started by me. I do not know Adele personally, and therefore have no idea what type of waders she would buy. I do “know” YGF, SchnitzerPHOTO, Erin Block, and Owl Jones so I am trying to pimp them. 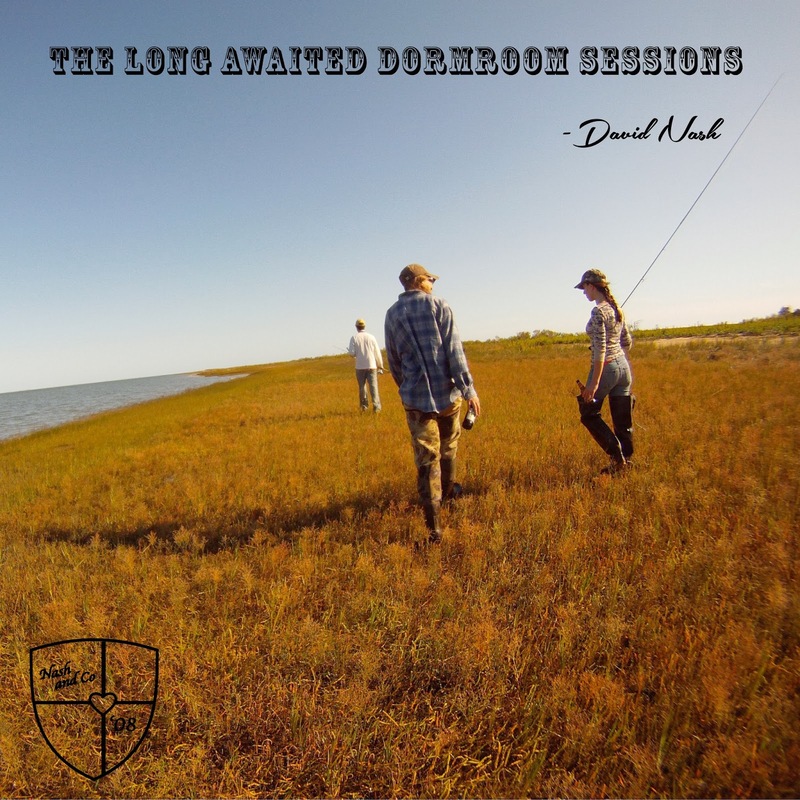 Author D NashPosted on May 9, 2013 February 21, 2017 Categories adele, BBQ exchange, blue ridge mountains, Brook Trout, Brookie, fly fishing video, george washington national forest, mike doughty, Owl Jones, schnitzerphoto, the fly collective, vimeo, ygf5 Comments on Rumor Has it there is a New MLW Video: Does It Get Any Better? TMF and ZP sightings… Things that never happen to me. In the time I’ve been blogging, I haven’t really ever run into other bloggers or even signs of their presence in the “real world.” That is, until last weekend. Get ready for the hyperlinks….. So last weekend at the Virginia Coastal Fly Angler’s yearly picnic, Sara and I indulged in more pulled-pork sandwiches and key lime pie than any two people should ever consume, and we sat under the park shelter chatting away about work and fishing with the other club members. 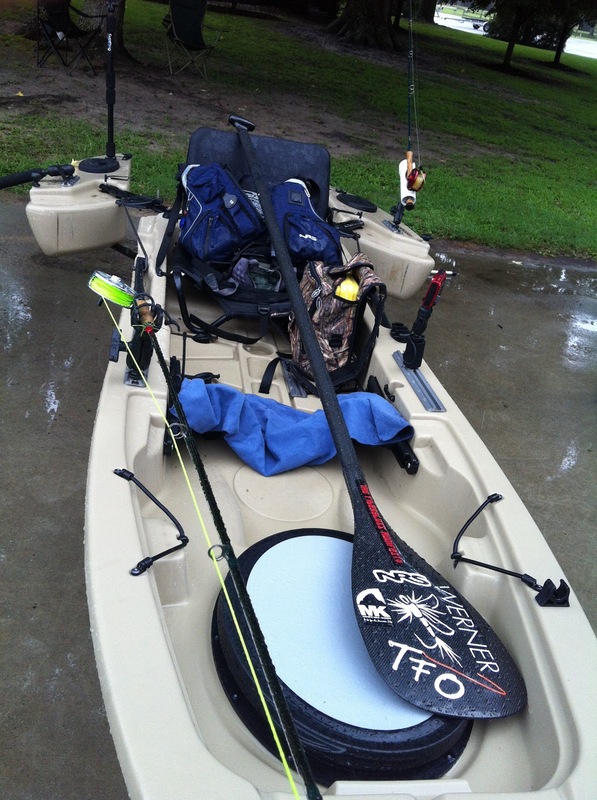 To our left, was a pimped out (yes, I said pimped) fishing kayak on display, for what purpose, I did not know. I did notice that there was one attendee I didn’t recognize who was instructing some fellow members on casting a fly rod with authority. 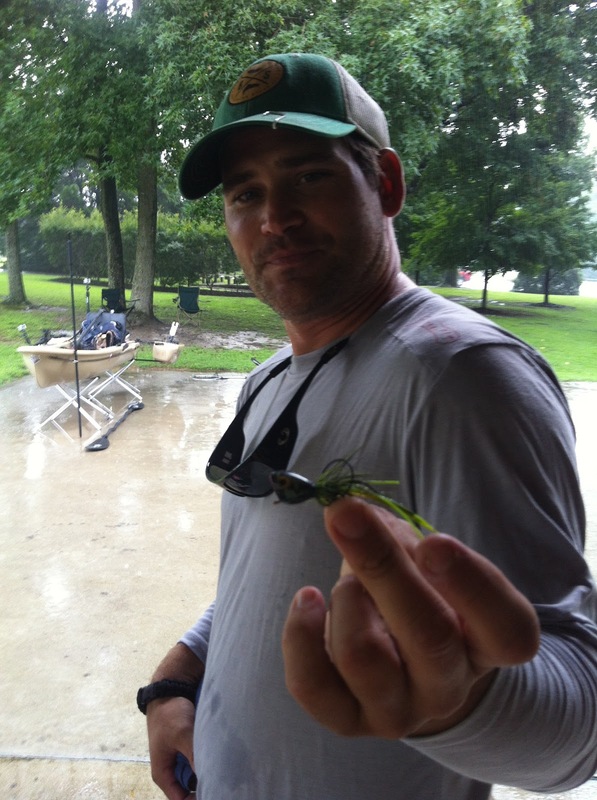 Come to find out, this was Cory Routh of Ruthless Outdoor Adventures. 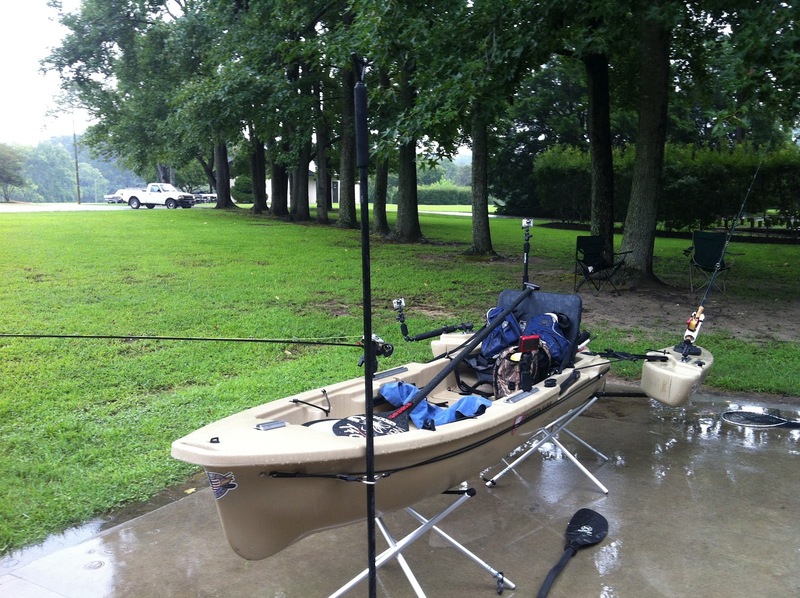 Today was his day to give a talk on fly fishing from kayaks. Lucky us. After a very informative talk and question/answer session, I took a closer look at his boat. 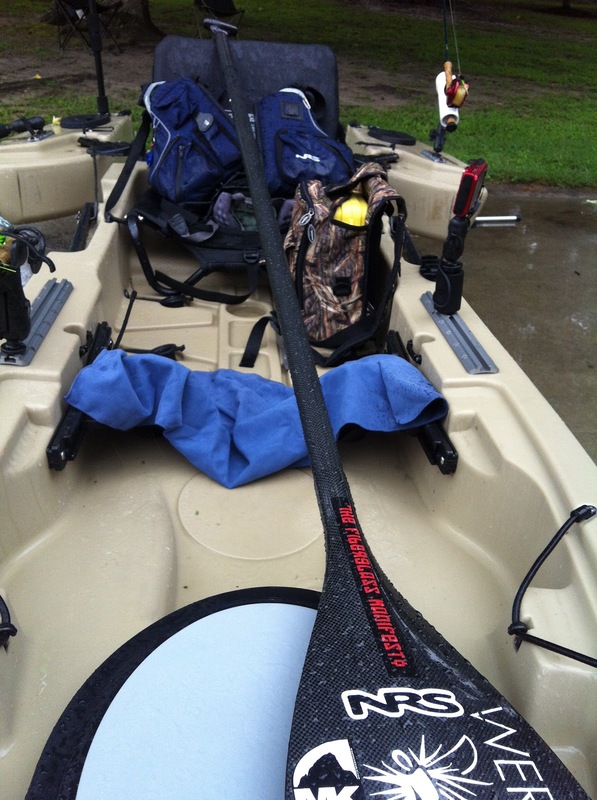 After ogling at all the gadgets and gizmos, I noticed his graphite paddle was decorated with a familiar sticker. All of a sudden I had my first Fiberglass Manifesto Sighting. Nice. Oh, but wait, there’s more. My second sighting was moments away. It was indeed. The one and only. We want on talking about them and how he was hoping to get them stocked in the new fishing section at Wild River Outfitters in Virginia Beach. In my mind, all I could think about was, way to go, Owl. TFM Kayak in the background. Author D NashPosted on August 23, 2012 February 21, 2017 Categories Owl Jones, tfm, zazzy pop, zazzy poppers1 Comment on TMF and ZP sightings… Things that never happen to me. The Owl Post (mail) came today. I feel like Harry Potter. I would have changed the name and address to my own. 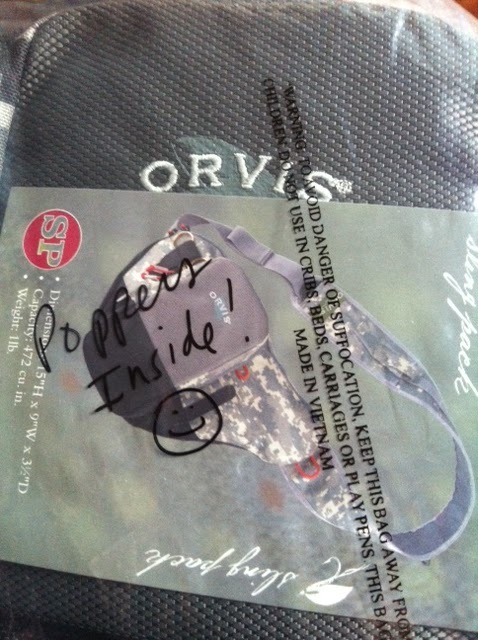 Owl Jones held a video contest for an Orvis Sling Pack. Did I need another pack of any sort? Of course not. My justification was that my current favorite pack is a blaze orange Lowe Alpine fanny pack. I use it like a sling pack. I figured this might be a nice opportunity to acquire something more official and less blaze orange. 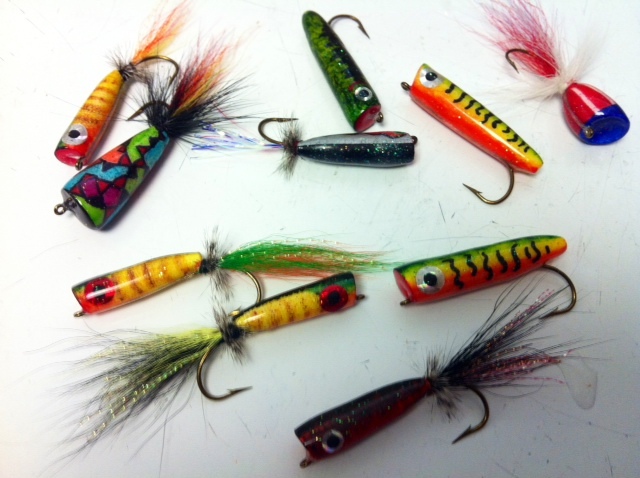 Zazzy Poppers! These are, honestly, quite awesome. See, it looks pretty snazzy, eh? Here is my entry for a video contest over at Owl Jones dot com. The result: See below. Instead of telling you, I tried to show you my denial and, therefore, show you my need for the pack. First things first. Business. I wanted to share a cool fly I discovered recently. 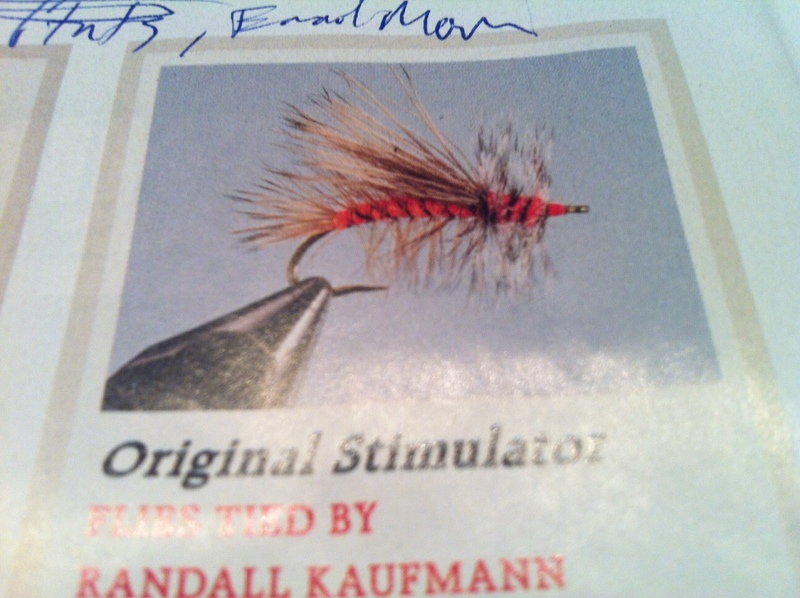 I learned about “the Stimulator” (credit is given to Randall Kaufmann as the creator) in the April-May issue of Fly Fisherman Magazine. 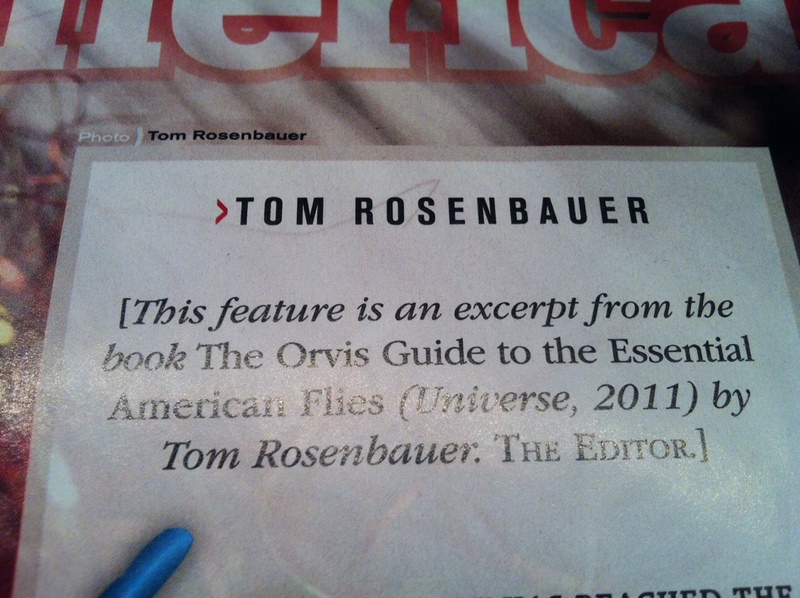 They featured and excerpt from the book The Orvis Guide to Essential American Flies by Tom Rosenbauer. I posted a picture of a few I tied here in a recent post. The Stimulator is a “match all” fly that can be fished in small mountain brookie streams, big Rocky Mtn rivers, and everywhere in between. 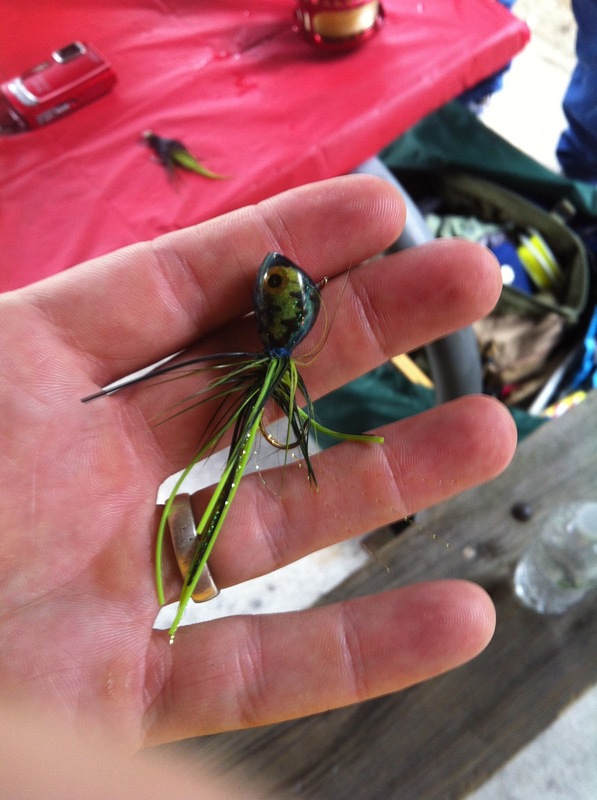 The article states the fly, tied in many sizes, with variations in color and body, can effectively mimic stoneflies, caddis, grasshoppers, and even Hex mayflies. 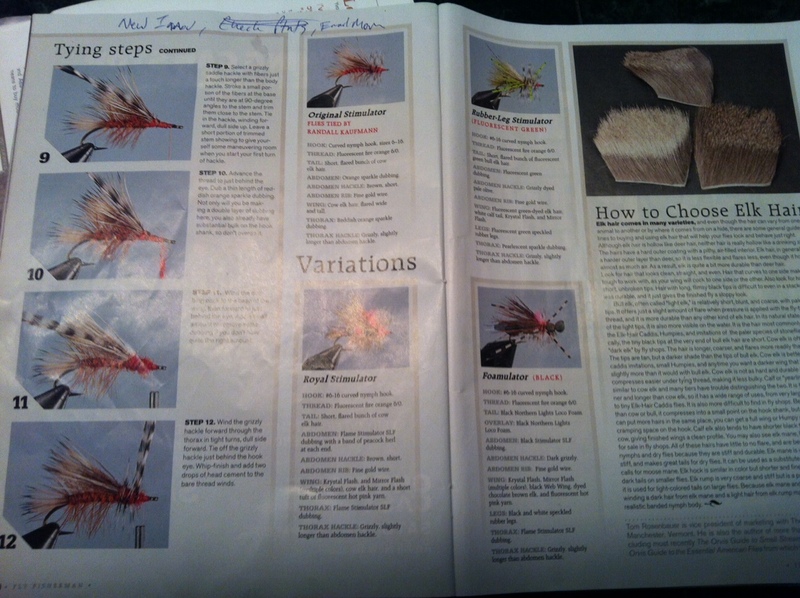 *** If you want the tying recipe and/or instructions, I’m more than happy to send them along. 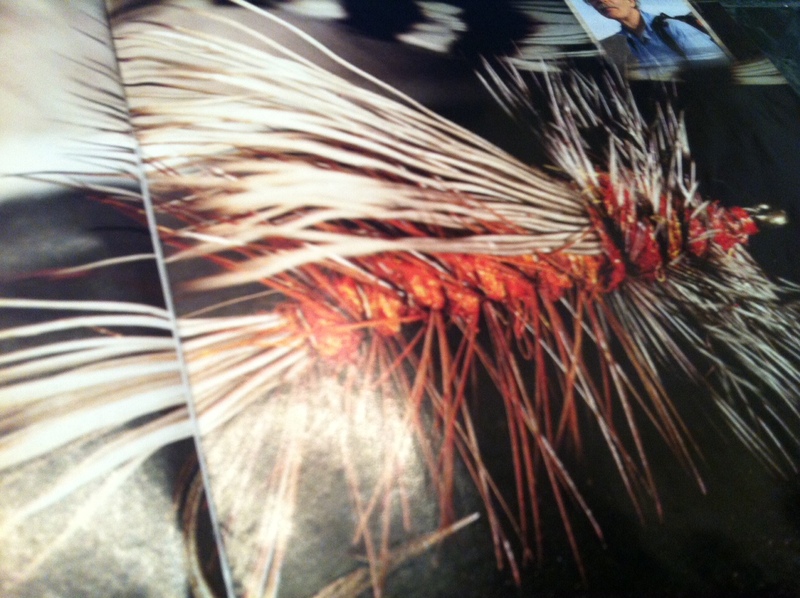 Now, the recipe calls for elk hair in this fly. I actually don’t have any. What I do have is a wooden pallet with some deer hide glued to it. My now 92 year old grandpa sent me that in the mail…. He cut the hide off of a roadkill deer. The lesson I learned from my grandpa: Don’t let anything go to waste. Awesome. 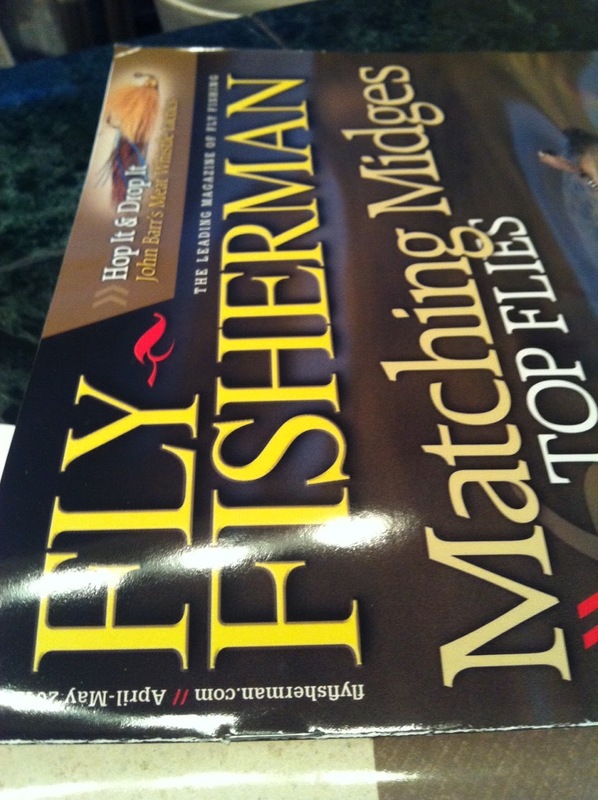 The article does show a few variant options for the flies and it also gives a guide on what to look for in quality elk hair. see the note at the top? don’t worry, I remembered to email my mom. I am excited to put this fly to work some time soon. Now, it is time to talk about something really, really important. As you may have noticed, the wife and I came up with a new logo this weekend. I really like it. I wanted a silhouette of a me (from a video screenshot. can you figure out which one?) with waders colored like water. The picture in my mind seemed so cool. But, since I lack the computer design skills, I was struggling to make the image a reality. I wanted it to be simple, sleek and recognizable, like Sander’s Poudre Bulldog or Yuke’s “YGF” or the T! 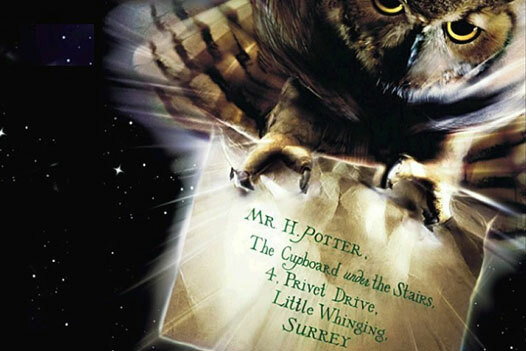 or Owl’s face (and owl)… So recognizable. But that is not where the story ends. It picks up this morning when I was hit unexpectedly with a hilarious realization. My “Leaky Man” is wearing Zubaz. As you can see, there is not much difference here. 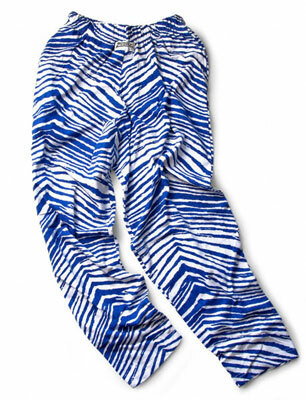 Now, if I remember my 5th grade hockey tourney days correctly, Zubaz were great for wearing over shin pads, sleeping in, and playing shinny hockey in the hotel hallways. They were not great for keeping you dry…. 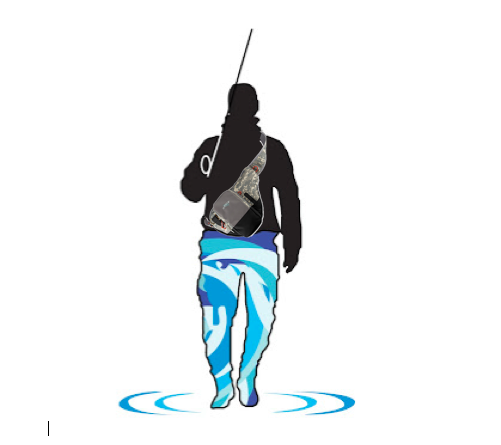 Now that I think of it, they would be a nice base layer beneath some waders…. Now, I will admit, there was a sudden rush of fear, and even embarrassment. I just slow-pitched myself right over the plate for several wisecracks, not that I hadn’t already by calling the logo “the leaky man” (let the enlarged prostate jokes commence), but still. I admit, i worried for a second. Then I realized something. 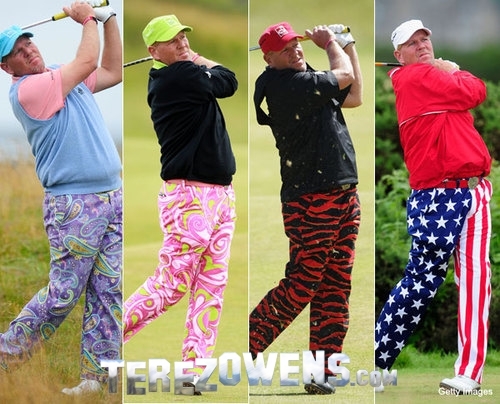 I’m in pretty good company with these Zubaz. Some pretty awesome people have been caught wearing these bad boys. How about that Dan Marino, eh? He’s even bold enough to sport the Zubaz shorts. And then, of course, there is John Daly. Any time you can place yourself in the same category as that guy, you can pretty much assume you’ve reached the pinnacle of success….. Well, maybe…. But really, The Dude wears them…. This logo mishap can’t be that bad. Can it? 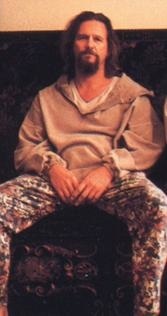 Well, if you find yourself asking, “Where can I get a pair of these cool, cozy, dare-to-be-different pants? 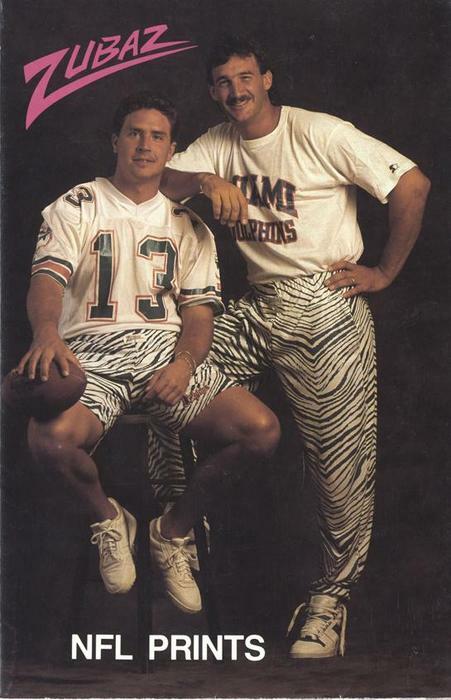 Surely they still don’t sell these.” You know what, they do still sell them, and you can find them here at the Zubaz website. I’m going to go right out there and say it, I support the Leaky Man and his right to sport the Zubaz. I may just have to pick myself up a pair, in blue, of course.